Set includes 1 solid spoon, 1 slotted serving spoon, 1 curved serving spoon, 1 solid turner, 1 slotted turner and 1 spaghetti server – 13.25″ long – Equip your kitchen with all the essential tools needed to perform all basic kitchen tasks. Utensil heads made of beautiful and natural acacia wood that is durable, water resistant and long lasting making these handsome utensils useful for food preparation, serving and for gifts as well. Ideal for tossing a salad, serving up pasta or to properly mix and flip other foods. 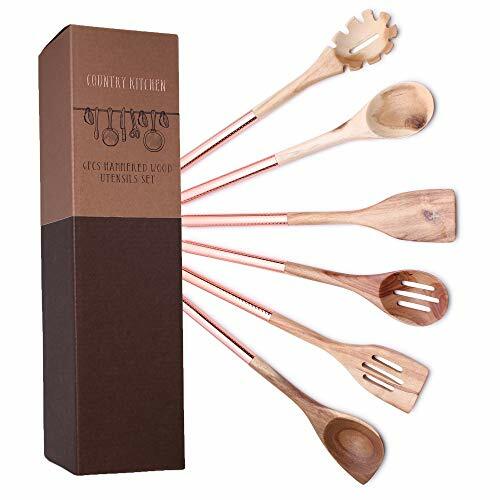 This uniquely designed set of fashionable kitchen tools mixes acacia wood with stainless steel copper handles; a great match with glass, wood or cooper and metallic serving bowls. A trendy and modern design with a twist of nature that will add style and class your dishes, pans and bowls. Safe for use on nonstick cookware, bakeware, and other delicate finishes ensuring that your pots and pans remain functional. Easy to keep clean simply hand wash with a mild soap and cool water. Do not soak. Do not put in the dishwasher, microwave or refrigerator. Dry thoroughly.